One of the leading causes of death is cardiovascular diseases followed by cancer. It is estimated that 1 out of 6 deaths is caused due to cancer. Within 3 years of the discovery of cancer its antidrug was invented hence proving that medical science has made enormous advances. On account of the growing demand for cancer curing drugs worldwide, the pharmaceuticals market, especially with regard to anti-cancer drugs is on hike. The Global market for anticancer drugs comprises of a highly aggressive vendor landscape. In view of a number of the largest leading pharmaceutical players of the world, the market is fragmented. The leading companies compete with innovative products and strong pipelines to boast the high efficacy and efficiency in the market. There is also a constant rise in the number of small players as they are focusing on innovative treatment methods. The global anticancer drugs market is estimated to expand to US$155.6 BN by 2025 with a 6-7% CAGR within the forecast period of 2017 to 2025. The previous market value of 2015 was at US$ 85.0 bn in 2016. Based on therapy, the anticancer drug market is segmented into immunotherapy, targeted therapy and chemotherapy. Immunotherapy is usually for treating melanoma, a dangerous form of skin cancer. The segment for targeted drugs accounts for more than 40% of share value in the global drugs market for anti-cancer. As compared to cytotoxic drugs, minimum side effects along with effective results and high specificity of the drugs are predicted to expand the growth of the segment by 2025. On the basis of cancer type, there is colorectal cancer, breast cancer, leukemia and lung cancer out of which lung cancer is predicted to expand at a strong CAGR of over 6% due to large number of lung cancer incidences and high prevalence and promising pipeline for non-small cell lung cancer (NSCLC) drugs during the forecast period. 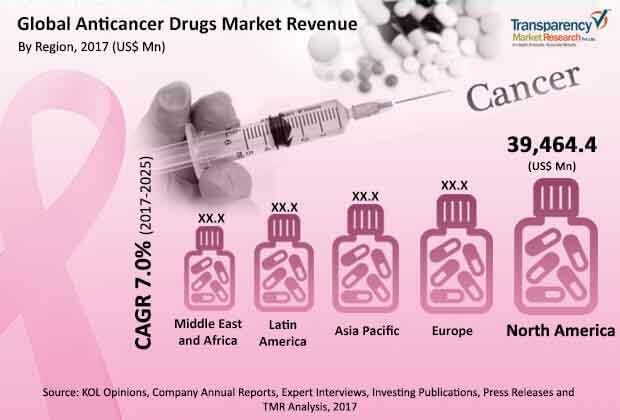 The global anticancer drugs market is studied on the basis of key geographies Middle East and Africa, Latin America, Asia Pacific, Europe, and North America. Among these, Germany, U.K. and U.S. show higher adoption for anti-cancer drugs compared to other regions. This is because of the prevalence of unhealthy lifestyle, developed healthcare infrastructure, targeted efforts of government and NGOs towards cancer management. North America is expected to grow at a rapid pace during the forecast period other than Japan and Australia which seems favorable for the market growth. Increased awareness regarding the benefits of early diagnosis, rising disposable incomes, rising prevalence of number of forms of cancer, and projected pipeline drugs are propelling the growth of the regional market. Due to the easy availability of drugs in the region, and high healthcare expenditure from both the private and public sector, North America is predicted to contribute largely to the anticancer drugs market globally. Apart from that, established players are entering China and India due to high prevalence making the market attractive. The markets in other regions such as Africa, Middle East and Latin America are expected to grow during the forecast period at moderate rate. In the global anticancer drugs market, companies like Amgen Inc, Takeda Pharmaceutical Company Limited, Eli Lilly and Company, and F. Hoffmann-La Roche Ltd are the key players.